Small and medium sized business can now perform Microsoft Exchange Server Backup easily using BackupAssist™. Perform live backups of Exchange Server - there's no need to stop your server before backup. BackupAssist handles the open files problems on Exchange Servers. You can also restore individual mailboxes using Microsoft's own tool, Exmerge. 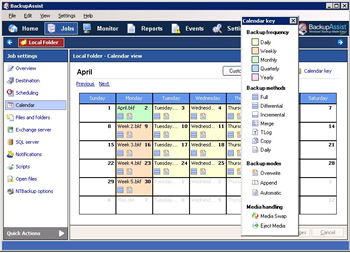 BackupAssist makes backup so easy, any business can setup an backup strategy in minutes. Just install and select one of BackupAssist's backup schemes. BackupAssist will send simple instructions by email to you or your secretary, for example, "Please place the tape labelled Wednesday in the tape drive". You don't need an expert to run your Exchange Server backup. Plus, the possibility of human error is minimized. BackupAssist also emails result logs. Check the status of each backup from your own computer, or even offsite. There's no need to access the Exchange Server to view logs.